Notre Dame will specifically be involved in this partnership to expand the basic science research capacity at Moi University School of Medicine. Notre Dame has a unique niche in the Consortium in that it is the only member not focused on clinical care and brings a history of expertise in vector control and tropical disease research. 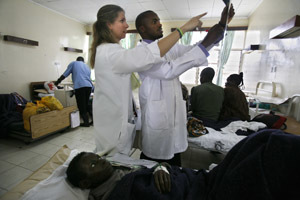 Notre Dame scientists are excited to participate in the partnership knowing they bring a history of experience and global leadership in the fight against tropical diseases including leishmania, malaria, dengue fever and lymphatic filariasis in addition to communicable diseases, tuberculosis and Ebola. The Eck Institute will lead and coordinate research and training activities for Notre Dame that address constraints to health care in western Kenya, and simultaneously contribute to building scientific research capacity. Joint research activities, participation in seminars and academic meetings, student and faculty exchanges, and special short-term courses will be used to advance the mission of the Consortium. Members of the partnership are committed to observance of equity and mutual respect with a desire of common values resulting in maximum benefit for all involved. The AMPATH Consortium is comprised of Brown University, Duke University, Indiana University, Lehigh Valley Health Systems, Providence Portland Medical Center, Purdue University, University of Utah, University of Toronto and now the University of Notre Dame. 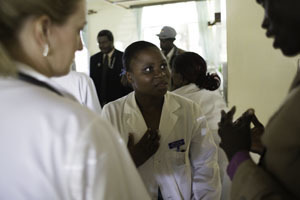 In 1989, Indiana University School of Medicine and Moi University School of Medicine agreed to join together to develop leaders in health care for both the U.S. and Africa. That mission inspired this team to provide invaluable training to future generations of health care providers on both continents. At the turn of the century, in the face of the deadliest pandemic in human history, Indiana University and Moi University responded by creating one of Africa’s largest, most comprehensive and effective HIV/AIDS control systems. This system is now expanding its scope to include delivery of essential primary care services and control of communicable diseases and non-communicable, chronic illnesses. The AMPATH Consortium in collaboration with Moi University, Moi Teaching and Referral Hospital, and the Kenya Ministry of Health delivers health services in more than 60 hospitals and clinics in rural and urban western Kenya, serving a population of 3 million people. Originally published by Sarah Craig at newsinfo.nd.edu on April 23, 2012.